bl.uk > Online Gallery Home	> Online exhibitions	> Asia, Pacific and Africa Collections	> Ahalyabaighat [Benares]. 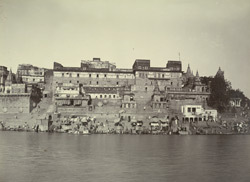 Photograph of Ahalya Bai's Ghat on the River Ganges, Varanasi from the Kitchener of Khartoum Collection: 'Views of Benares. Presented by the Maharaja of Benares' by Babu Jageswar Prasad in 1883. Ahalya Bai's Ghat was named after the Queen Ahalya Bai Holkar of Indore, who also sponsored the Vishwanatha Temple in the 18th century. The Ganges was said to have descended from heaven to earth, it is regarded by Hindus as amrita, the elixir of life; those who touch the water are said to be absolved of sin. The waterfront of the city is lined with over 100 ghats with long flights of stone steps where residents and pilgrims come to perform their ablutions and worship in the temples. Varanasi, founded in the sixth century BC is one of the seven sacred cities of the Hindus and is known as tirtha, or ‘crossing place’ which allows the devotee access to the divine and where gods and goddesses can come down to earth.